As a bona fida charity the RNLI exists purely because of volunteers and donations. All RNLI stations endeavour to raise funds in so many ways over and above annual flag weekends. The station and crew are supported by a wealth of volunteers whose aim is help maintain to high profile of the station as well as raise the vital funds. One such body of volunteers the "Friends of Whitby Lifeboat" or FOWL as they are known work tirelessly away in the background. 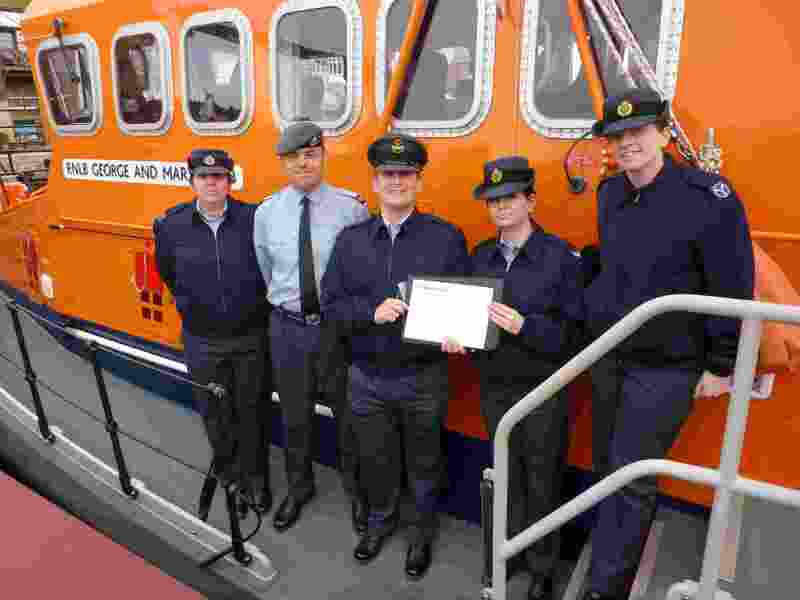 Members of RAF Fylingdales came on a visit to RNLI Whitby Lifeboat Station on Monday 17th January 2011 to present a cheque for the work of the Royal National Lifeboat Institution. This was a share of the money which they had raised through many benefit occasions from 2010 and the cheque was received on behalf of the RNLI by Canon David Smith, Hon Chaplain and Volunteer Press Officer. The Friends of Whitby Lifeboat held this this years SOS fundraising night called Songs of Spring, which was held at the Whitby Conservative club on Sunday 31st January. Local well known naturualist Mr Brian Lake gave a slideshow and talk about the wildlife and flowers of the North Yorks moors and dales. The event was well supported and the members of FOWL served refreshments and held a raffle. The sum raised was £325.00 which is a good start to the fundraising year. This is the second time Mr Lake has given his time to raise funds for the Whitby Lifeboats. Kind-hearted staff at The Co-operative Group’s food stores have donated £30,000 to the Royal National Lifeboat Institution (RNLI) after staging several fundraising events last year. Workers at 67 stores across the North region raised the money, which was presented to crew at the RNLI’s lifeboat station in Whitby, by holding charity car washes, fancy dress fundraisers and raffles, as well as fun days and party nights. Other events included a football match between Co-operative management and staff at Whitby Town FC’s Turnbull Ground before a crowd of more than 200 people who helped raise £2,500. Super-fit fundraisers also competed in the Great North Run and the Amsterdam Marathon. A MESSAGE in a bottle has arrived in Whitby to help raise awareness of life-saving charity, the RNLI. 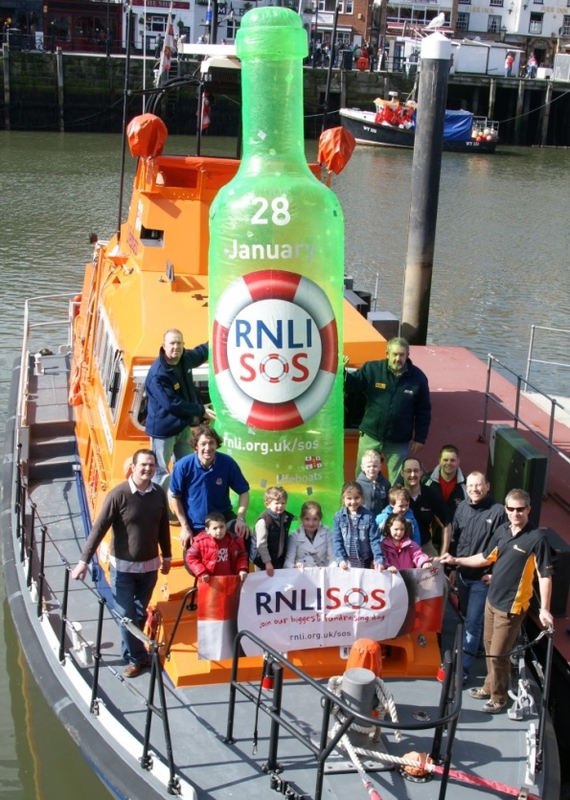 A huge bottle is being relayed via all of the UK’s 235 RNLI lifeboat stations as part of The Round Table’s fund-raising initiative and it stopped off in Whitby last month (March). The organisation’s national fund-raising target is £150,000 this year, with all proceeds going directly to the RNLI - their chosen charity of the year. Giuseppe La Vigna, secretary of Whitby’s Round Table said, “We received the bottle from Scarborough and passed it on to Stokesley’s Round Table at Staithes’ lifeboat station. “We hosted our annual quiz on the Thursday 24 March which saw around 100 members of the local community get involved. 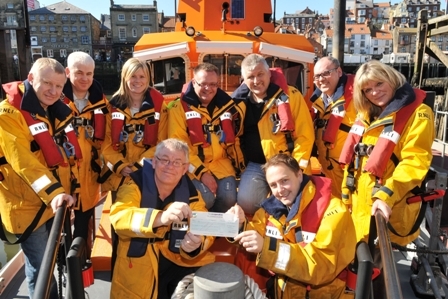 “£1,000 was split between Whitby’s lifeboats and worthy local causes; we regularly support local clubs and schemes". “We’re constantly looking for new members, and want to make people aware that the society is a contemporary one with a modern outlook.” The relay started at the Round Table’s headquarters in Birmingham on 14 January and will end on 6 May in Blackpool. This year heralded two new fundraising events in April, a 10k walk and a 15k route for the more adventurous, both now refered to as Whitby Welly Walks (www) with details below. Join us in the beautiful town of Whitby to raise some vital cash for our volunteer crew members! The 10k walk goes North along the beach and back for families, with some extra fun activities. 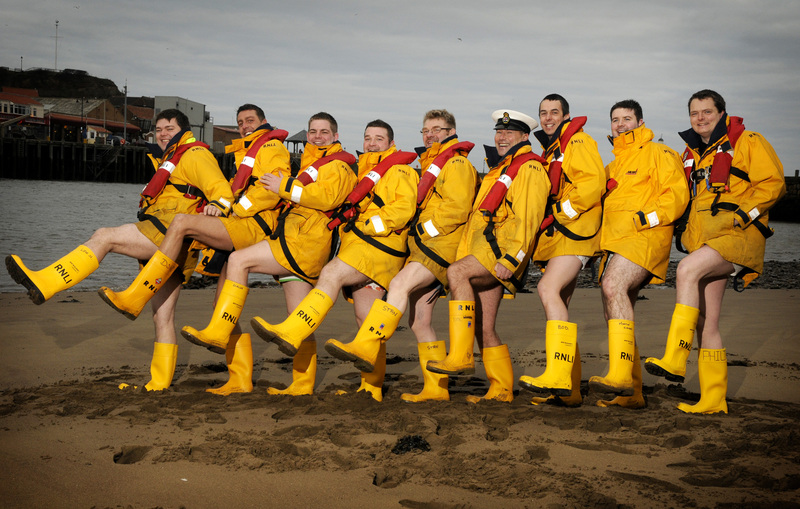 Wearing wellies is optional but we do ask that every adult raises £42 in sponsorship - the equivalent of the cost of a pair of wellies for one of our crew members. It promises to be a day of wonderful welly fun, those with any questions should have a look at the frequently asked questions document or contact Chloe using the details below! Join us in the beautiful town of Whitby to raise some vital cash for our volunteer crew members! The 15k route takes you along the rugged coastal path and is more suitable for older children and adults. Please note that all participants must be over the age of 10 and fit and able to walk for around 3 hours. Wearing wellies is optional but we do ask that every adult raises £42 in sponsorship - the equivalent cost of a pair of wellies for one of our crew members. The RNLI had the frequently asked questions online to support the event, 10k / 15k but with the passing of the event I have retained them here in readiness for next year. The Whitby Welly Walks were an ideal way for people to show their support for Whitby Lifeboat Station.